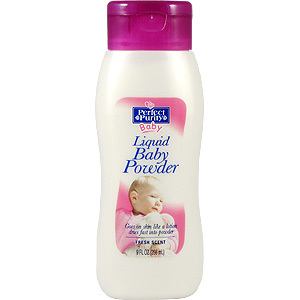 Our liquid baby powder goes on like ordinary lotion that quickly dries into a powder. Shake bottle before use. Apply with your hand as you would any lotion. Use after bath and diaper change. After use, wash hands to remove any residue. 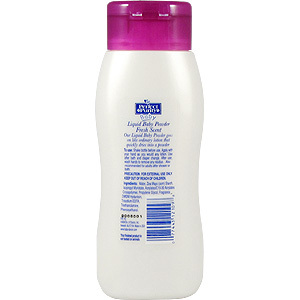 Also recommended for adults after shower or bath. PRECAUTION: FOR EXTERNALY USE ONLY. KEEP OUT OF REACH OF CHILDREN. Water, Zea Mays (com) Starch, Isopropyl Myristate, Acrylates/C10-30 Acrylates Crosspolymer, Propylene Glycol, Fragrance, DMDM Hydantoin, Trisodium EDTA, Treithanolamine, Phenoxyethanol. 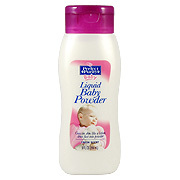 Liquid Baby Powder is shipped in a discrete, unmarked package. Orders are processed immediately and usually take about 3 to 5 working days to be received. We do ask that you try it for 2 to 3 weeks to feel the full effects. Any information received is used only for order processing and shipping purposes. Your information, such as e-mail address, will never be disclosed to a third party.